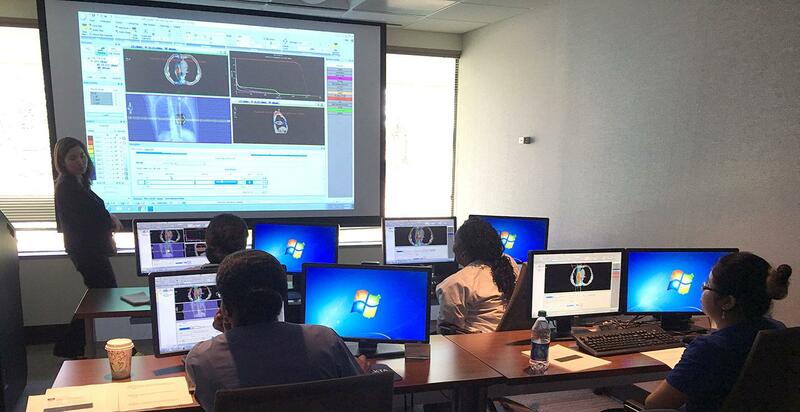 Here at Cambridge College’s Atlanta Campus, our Radiation Therapy department has been moving and shaking! We recently acquired a set of 3 lasers that were installed on campus that will allow our students to learn the basic concepts of radiation therapy: patient leveling, basic patient set up positions, and how to interact with a patient. This is very important to start early so that the student will feel more prepared when they move into a live clinic site. We utilize this lab in our RAD 1001 course, Introduction to Clinical Operations. The students feel that this has been a great addition to our curriculum and it really makes concepts that have been discussed in class “come together” for them! In February, 2017, our RAD 2001 class, Treatment Planning II, was able to go to the Elekta Learning Center here in Atlanta. Elekta opened up their treatment-planning lab to us and provided a trainer for our seniors in an all-day seminar. Our students got to utilize the Monoco treatment planning system and do “live” treatment plans. Each student had an individual workstation and was able to receive one on one training as well as training in a group setting. We plan to continue to add these wonderful opportunities for our students and look forward to the next great thing!